The well-funded smart grid startup announces a marketing agreement with a subsidiary of a group representing community-owned electric utilities. GridPoint has released a new version of its software with new home energy and utility load management capabilities and a way to integrate an older "smart meter" technology into its platform – and it has landed a marketing agreement that could lead to deals with utilities interested in using it. The Arlington, Va.-based startup said Monday that it has a marketing alliance with Hometown Connections. Hometown is a services subsidiary that represents about 650 members of the American Public Power Association, a trade group for the about 2,000 publicly owned utilities around the country. Those smaller utilities serve about 45 million customers across the country. While the announcement didn't mention any sales of GridPoint's software, it did say that it will provide "favorable commercial terms" and set GridPoint as Hometown Connection's "exclusive smart grid software platform provider," the company announced. GridPoint is promising utilities a software suite that ties together energy efficiency, load management, the integration of distributed energy sources like solar and wind power and the management of energy storage and electric vehicles. It's raised a lot of money to do it – more than $220 million since its 2003 founding. Its last round for $120 million in September was among the biggest yet for a smart grid startup, and helped it buy car charging technology developer V2Green and promise more acquisitions to come (see GridPoint Gets $120M, Buys V2Green). Now the question is, which utilities are interested in buying what GridPoint has to sell? Like some of its fellow smart grid startups, GridPoint has been involved in some large-scale pilot projects – in its case, with Xcel Energy, Duke Energy and Austin Energy – but has yet to announce a large-scale commercial deployment of its software. Those pilot projects include Xcel Energy's $100 million SmartGridCity project and another project to manage large-scale energy storage for a wind farm (see GridPoint to Manage Wind Power Battery Storage). It is also playing a role in Austin Energy's Pecan Street Project, which is in its early stages, and is involved in an electric car-charging project with Duke Energy (see Top Ten Smart Grid: Utilities). GridPoint's experience in those pilots, along with conversations with potential customers, have led to some of the new features of GridPoint's "Platform 3.0" version of its software it announced this week, Jeff Ross, head of marketing, said Tuesday. Given that this is likely the first step utilities will want to take with their smart grid deployments, it makes sense. After all, among the most pressing challenges utilities face today is curbing peak power demand – the spike in power use that mostly during hot summer days when lots of air conditioners come on at once. Meeting peak demand has forced utilities to build or contract for power generation facilities that may only provide power for a handful of hours every year, an expensive proposition. Many makers of in-home energy management devices and systems are seeking to sell them through utilities that could see peak demand reduction as the first step in overall energy efficiency efforts (see The Smart Home, Part II). GridPoint would also like to help utilities automate those peak-shaving processes, Ross said – a process that's being tested in other smart grid projects, such as Duke Energy's Charlotte, S.C. microgrid project and the Department of Energy-funded FortZED project in Fort Collins, Colo. (see Sequentric Working on Duke Pilot Project and this Green Light post). "Things like environmental signals, customer preferences, even market-based pricing – all those types of things could help drive automated demand response events," he said. But for customers that don't have in-home energy management devices installed, GridPoint is adopting its consumer portal for use without in-home energy devices, Ross said. To give customers a view into their energy usage, GridPoint's consumer portal can now be used without in-home energy devices to track a home's overall energy use and compare it to past times and to other homes in the neighborhood, he said. The portal can still be linked with in-home energy management devices to come, including ZigBee-enabled thermostats, he said. GridPoint has worked with energy management device makers Energate and Entec among others, Ross said, and also has been working with in-home energy, security and entertainment system maker Control4 (see A Broadband Smart Grid?). And, while GridPoint has said it doesn't necessarily see smart meters as the key path for energy data to flow between utilities and their customers, the company's new software will help an older class of smart meters do just that. Those are so-called AMR, or automatic meter reading, meters that send out energy data but aren't able to take incoming communications. 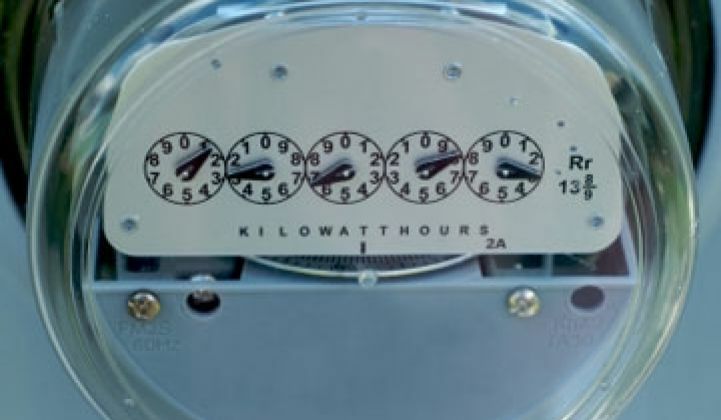 There are tens of millions of those meters in the field, giving utilities incentive to connect them for increased functionality - a task that's being taken up by other smart grid players, such as Tendril (see Tendril Moves to Link Up Old-School Meters). GridPoint said its Platform 3.0 software would be able to integrate readers of the ERT (encoder-receiver-transmitter) devices that transmit data from those AMR meters. As for when GridPoint expects to see its software commercially deployed, Ross remained mum. But in general, "In terms of an end to end, complete territory deployment, the industry – that could be with us, that could be with someone else – is within 12 months of seeing something like that," he said.